WASHINGTON, April 7 (CGTN) -- U.S. 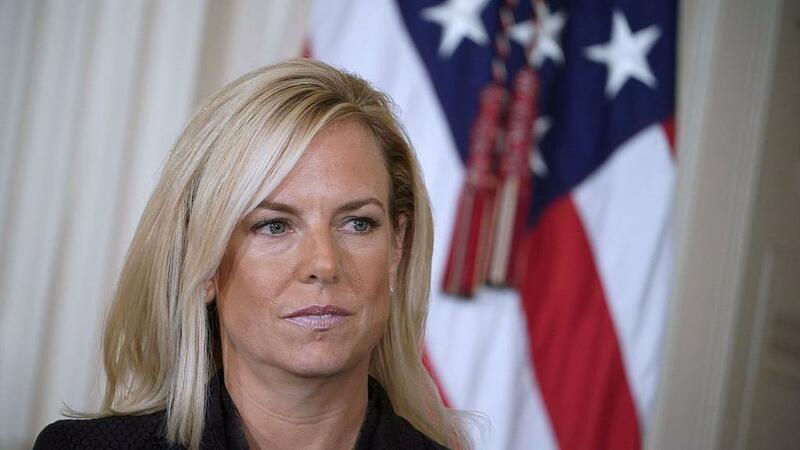 Homeland Security Secretary Kirstjen Nielsen, who oversaw President Donald Trump's bitterly contested immigration policies during her tumultuous 16-month tenure, resigned on Sunday amid a surge in the number of migrants at the border with Mexico. Nielsen, 46, held the position since December 2017. As it includes immigration and customs enforcement, her department is responsible for carrying out some of Trump's most contentious policies as he has sought to cut back on the number of Mexicans and Central Americans entering the U.S. without proper documentation. Repeatedly subjected to tough questioning by Democrats in Congress, Nielsen has overseen Trump plans such as his effort to build a wall on the border with Mexico and the separation of migrant children from their families. Trump has made a clampdown on illegal immigration a centerpiece of his two-year-old presidency, leading chants of "Build that wall" at his rallies as he has sought to cut back on the number of newcomers entering the U.S. without proper documentation. He insists that the arrival of immigrants across the southern U.S. border constitutes a national emergency. He recently threatened to close the border, or parts of it, if Congress did not change U.S. laws to fix what he called immigration "loopholes."